Ancient Scrolls | A Bible Themed Escape Room Adventure in Branson, Missouri · Escape Code Branson | USA Today #5 Best Escape Room in the nation! Experience an exciting Bible adventure at Escape Code! We are excited about the power and life found in the Bible! We believe the true stories found there should not only be read. They should be experienced! Condemned is an escape room Bible adventure from the creators of the rooms at Escape Code in Branson, Missouri! The Bible will explode to life with your group at the center of the action! Your group will feel the rush of being immersed in settings and stories found in Scripture. You will have sixty thrilling minutes to solve the mysteries and escape in victory! 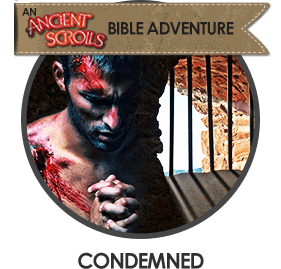 Condemned and beaten, Paul and Silas were cast into a Roman prison. You have followed them into the dungeon depths, where your plight rests in the hands of a sympathetic guard or perhaps, someone greater. While Paul and Silas have made their escape, your future is uncertain. The path to freedom may be different than expected. Can you find it before it’s too late? You can also book one of our other thrilling adventures at Escape Code!